Choosing the right hand dryer for your washroom is a challenge. You can end up with a dryer that satisfies your heavy use requirements but at a heavy energy cost too. We can offer you a wide range of hand dryers including high powered, low energy, fast drying units. Be assured we will recommend the right hand dryers for your washroom needs only after undertaking an audit of your washroom at which we will analyse your washroom traffic. You may be considering moving from using paper towels to having hand dryers installed instead. Let us provide you with a clear cost and energy comparison so you can make the right decision. We’ll tell you the annual running cost of each hand dryer and how this compares with your current hand drying facilities. Installation by qualified electricians is part of our service. 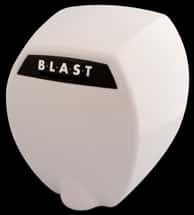 The Blast hand dryer simultaneously blows water off hands and evaporates residual moisture, drying hands completely in approximately 10 seconds. Using 16th of the energy used by conventional hand dryers, Blast is extremely environmentally friendly. It costs up to 95% less than paper towels to operate, and compared to conventional warm air dryers, costs 80% less to run. Available in: black, white and chrome. Did you know that you can save a massive 70% on your running costs by switching to one of our quick dry, low power draw hand dryers versus a traditional dryer? This is based on an average washroom usage of 150 dryer uses per day. We’ll provide you with an exact quotation but these figures are exciting aren’t they? Park the paper towels! If you switch from using energy consuming landfill greedy paper towels to one of our low power draw hand dryers you can save 97.5% on your running costs! Again, we will provide you with an exact quotation so you can compare the financial and environmental cost of paper towels versus our hand dryers. One of our premium eco-hand dryers can cost as little as £27.22 per year compared to £1095 for paper towels… It’s well worth booking a free energy audit with Dyno Washrooms. Perfect for high traffic washrooms, our premium easy to clean, robust eco-hand dryers combine effective fast hand drying (from 12 seconds to 17 seconds drying time) with low energy usage. Book a free hand dryer energy audit with Dyno Washrooms. We can offer you a wide range of classic design high power 2300W and 2400W automatic hand dryers in white or brushed stainless steel – ideal for high traffic washrooms. These easy to clean and reliable hand dryers are exceptionally robust and have a two-year or three year guarantee. Drying times range from 25 seconds to 30 seconds. When your washroom budget has to stretch, a Value Hand Dryer is ideal – a much better and more hygienic alternative to environmentally unfriendly and by comparison, expensive paper towels. Dyno Washrooms can provide you with an attractive range of Value hand dryers that are available in white plastic, brushed stainless steel and white metal finishes. Don’t assume value means inferior quality. Every one of the hand dryers in our Value range is high quality, reliable, easy to clean and comes with a two-year guarantee. Drying time is 30 seconds.